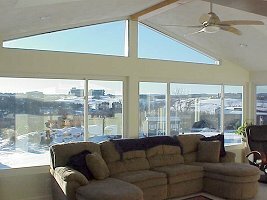 A Sunroom can give you a bright, outdoor feeling year round, without feeling the effects of the weather. A custom-designed, custom-built, energy-efficient year-round Sunroom... Cathedral ceilings, recessed lights, ceiling fans, exposed oak beams, lots of insulated low-E glass, including trapezoidal glass in the gable ends... Skylights and gas fireplaces are a nice touch, too. We can open up the existing wall to make the Sunroom an extension of your present living space, or we can install insulated French doors to keep the Sunroom separate from the rest of the house. Talk to Don about Sunrooms!